At the age of three years, Rhonda began to show interest in the piano, playing such familiar tunes as Away in a Manger and various TV ad jingles by ear. She began piano lessons the next fall at the age of four and continued through all her primary and secondary school years. She completed a Bachelor’s of Science in Music Education at the University of NE-Lincoln in 1980 as a piano major and vocal minor. Rhonda has taught piano and voice for 31 years and during that time has also been certified by the New School of American Music-Chico, CA, to teach adult piano workshops in chord style piano and how to play by ear. She has seven compositions in the elementary and intermediate levels which were first published by Myklas Music Press, Denver, CO in the mid 1990’s and are now owned and published by Alfred Publishing Co. Among those titles are Holiday Parade, Hound Dog Strut, Ocean Sunset, Get Away Rondo, Faded Poem, Sincerely Yours and Playful Pranks. The first, Holiday Parade, was published in the spring of 2015 by Frederick Harris Publishing of the Royal Conservatory, Canada. Rhonda has numerous other solos which are now available for purchase and download at http://www.noterunner.com/vendor/rhonda-bennett. 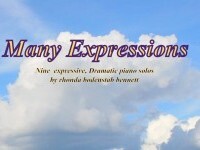 It is Rhonda’s sincere hope that the music contained in the “Every Thought of You” collection will be widely enjoyed by listeners and pianists alike. The eight solos are of medium difficulty and encompass styles including Pop, New Age and Jazz. Her philosophy as a musician stems from the premise that music is a God given gift and, she believes, should be uplifting and relevant to life for today’s pianist and the everyday person who listens to music for its positive value. Melody, expression and rhythmic appeal rank high in Rhonda’s musical priority list and these elements are featured in the eight solos in this collection.